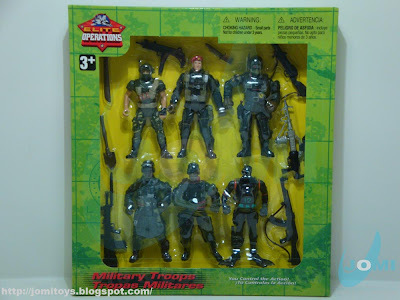 Before those dreadful excuses for action figures this short running "Toys R Us" line had, and even longer before "True Heroes " replacing "Soldier Force" within good old "Children´s Supermart", Elite Operations line had these 6 packs which was comprised of 13 original figures selected from previous Chap Mei´s Soldier Force sets. All this before the entire line was removed due to Violation of Lead Paint Standard. The color schemes ranged from the already existent to some new "in between" camouflages. Out of this "hall of fame selection" were some other 13 or so figures, which makes me think that eventually, there may have been more 6 packs. However, during some longs months and more than half a dozen stores visited, these 3 were the only sets I´ve seen on their shelves. 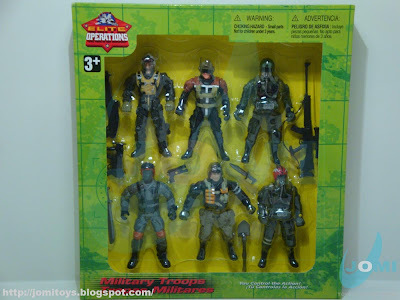 Figures (left to right, top to bottom) : "John Falcon", Soldier Force 1 unnamed figure (pilot), "Captain Red A6", "Paratrooper", "Lieutenent Cooper (tank commander)", "Captain Red A6 - red helmet variation". 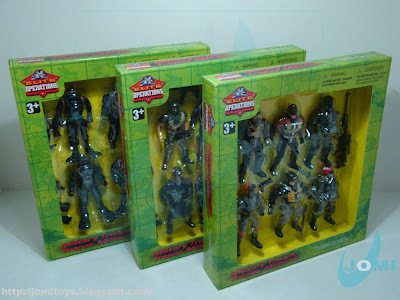 Figures: Soldier Force 1 unnamed figure(tank commander), "Colonel Stewart (zone commander)", "Techno Sniper Nighthawk", "Flamethrower Burns", "Tactic Commander Owl 218", Frogman (articulated feet version). Figures: Frogman(articulated feet version), "Frogman Deepdive", "Dean Octogear", "Frogman Deepdive" - black and blue cammo, "Dean Octogear" - red and blue color scheme, "Frogman Deepdive" - black and green cammo. 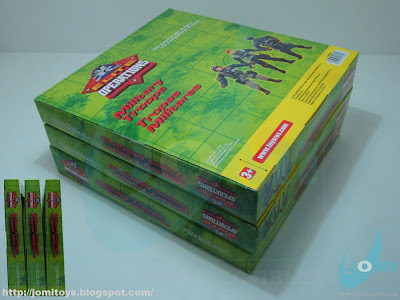 Presently, "True Heroes" line also has something in these parameters and also offers a couple of 6 packs (figures being presented in a line instead of 3 by 3) and even sets like True Heroes Military Action Figures - 2 Pack Striker and Maverick . We´ll review those in the future. Basically, these are army builders. 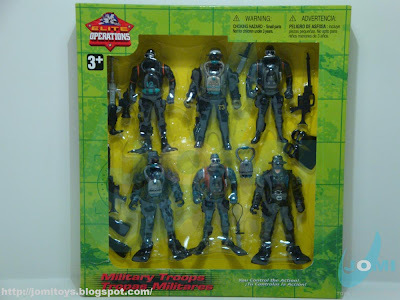 However, due to their lack of articulation and particular positioning, they can hardly be used as "common joe guys". 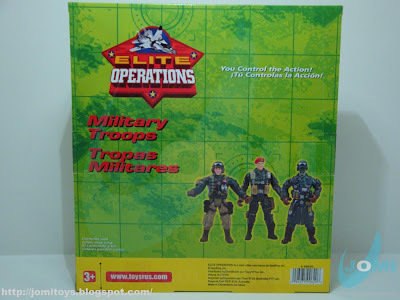 That´s where Power Team Elite earns lots of points over Chap Mei figures. I've two guys with the long coat. They are great sculpted and I use them as NATO commanders. HOW MUCH IS THIS COST? ?